The year 2017 marks 170 years since the Choctaw Native American tribe bestowed a gift to the Irish people during the Great Irish Famine. In 1847, the Irish people were two years into being ravaged by the Great Hunger. The Irish Potato Famine was a period of mass starvation and disease as a potato blight wiped out the main source of food for most of the population in Ireland. It is estimated that one million people died and another million people emigrated to other countries trying desperately to look for food and work. Across the ocean, the Native American Choctaw tribe had suffered great oppression but despite this, in March of 1847 known as ‘Black ’47’ in Famine history as it was a year of intense struggle and death, the tribe managed to raise up to $710 (around $19,720.65 today) and sent it to Ireland to help their fellow man. This kind gesture came only a few years after the Trail of Tears, an oppressive regime in the United States which involved the forced removal of Native American tribes from their homes and relocating them hundreds of miles away, a journey which the tribes had to walk. Thousands of people died while en route to their dictated new homes from starvation, disease, and exposure. For these impoverished people, raising such a large amount of money for people they had never met showed such a huge capacity for kindness. In 2015, a sculpture was commissioned to commemorate this act of generosity. 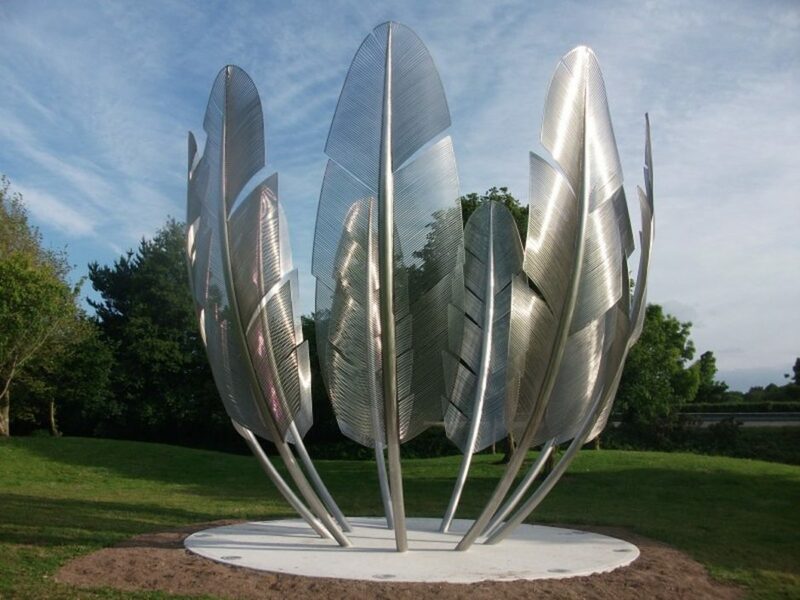 Cork sculptor, Alex Pentek created ‘Kindred Spirits’, nine 20-foot stainless steel eagle feathers arranged in a circle which is now situated in Bailic Park in Midleton, County Cork. “To see members of your family drop to the side of the road and to be powerless. To change that course of history. That stirred my imagination. I wanted to show the courage, fragility and humanity that they displayed in my work”. The Great Famine was a time when relations between Ireland and Britain were at their lowest. The British have been blamed for not only creating the conditions that led up to the famine but for also not doing enough to help the dying Irish. It’s easy to think the Choctaw Indians must have felt great empathy with the Irish people’s struggle as they too had suffered starvation and exile from a foreign governing body. The sculpture is not the first time the 1847 gift has been commemorated. Both groups of people have come together many times to help bring attention to famine around the world. In 1990, a Choctaw delegation took part in one of the first Famine walks to take place in Doolough in County Mayo. In 1992, a group of Irish people walked the Trail of Tears, a 500 mile stretch from Mississippi to Oklahoma in the United States while also raising money for charity. Mary Robinson, the first female president of Ireland, was made an honorary Choctaw chief.